Motorcycles Ride Through Florida's "Alligator Alley"
With the recent news of the wildfire that shut down parts of Florida’s Alligator Alley, we’ve heard many stories from local motorcycle riders and their experiences, while riding that stretch of I-75. Some more nerve-wracking than others. We thought we would share a great motorcycle route that takes you through Alligator Alley, for those of you that may be looking for a thrilling ride. Whether you start in Naples, FL. and head to Fort Lauderdale or vice versa, you can ride the full 78 mile stretch of I-75 known as “Alligator Alley.” Although the trip with take you through the Everglades which may be awe inspiring, there really isn’t much to see through most of the stretch. So, how is the riding thrilling? Well, you will cruise down a two lane highway with nothing but swampland on both sides of the road for a vast portion of the trip. Stopping to cool your feet in the water is highly discouraged! Unless of course, you feel like wrestling with the gators. But once again, we don’t recommend it! Make sure that you fuel up for the ride, especially if you want to take the trip at night. Although fences have been built to try and keep the gators off the road, running out of gas or breaking down at night may be nerve wrecking as alligators do make their way onto the highway. Now there is a road that runs parallel to Route 75, off Tamiami Trail. 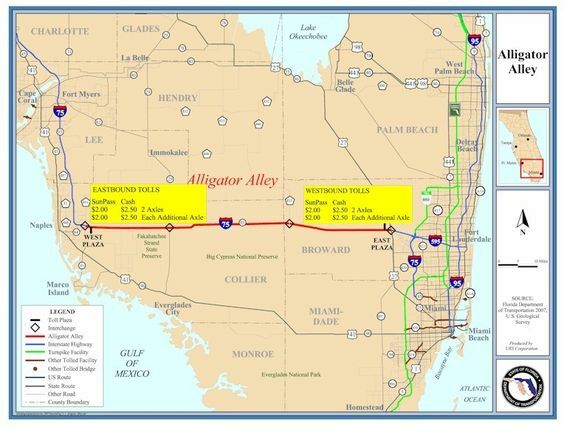 According to this article, it is the “real alligator alley.” Apparently, it is the road to the south, that connected Miami Florida with Florida’s Gulf Coast. From what it says, you really DO NOT want to stop if you’re on a motorcycle. Gators will even come up or near cars, so take a pass! It’s called the Loop Road and is part of the Big Cypress National Preserve. If you’re a bird watchers or ornithologists, then take a car, you won’t be disappointed. Make sure to tell us about your trip through (or near) Alligator Alley, and ride safe! This entry was posted in Motorcycle Routes and tagged Alligator Alley, Motorcycle riding 1-75, Motorcycle trip through everglades, Motorcycles alligator alley ride. Bookmark the permalink. ← Get Ready for the Flora-Bama Bikefest!